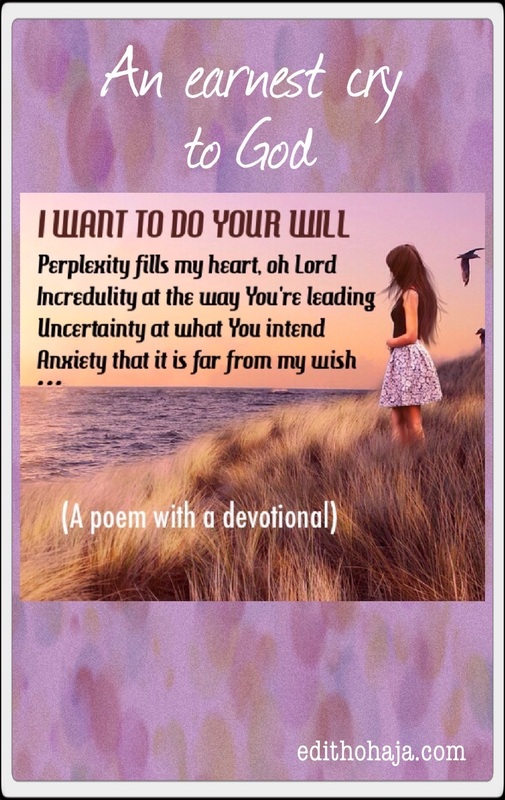 This is a poem with an accompanying reflection on the conflict we face when we ask for God’s will and it turns out contrary to what we want or expect. Read and be blessed! Have you ever been in a situation where you’re asking God to direct you on a matter and when you sense where He is going, you balk? I have, a countless number of times. Questions like: “Is this what I prayed for?”, “How does this help me reach my goal?” or “Is this a disappointment or what?” begin to fly through one’s mind at such times. But if we can just trust God and keep moving as He leads, in faith, even though we don’t understand, approve or are delighted with where He’s taking us, we’ll have a testimony in the end. The truth is things aren’t always what they seem and only God knows the end from the beginning. The Bible says that when God brought Israel out of Egypt, He didn’t take them through the highway crossing the land of the Philistines to Canaan although that road was shorter. Rather, He took them through the desert (a far longer and more arduous route). It seemed like a bad choice but He had a good reason (if they faced war so soon after leaving Egypt, they might have decided to go right back – better the harshness of the desert than the brutality of war which they were ill-prepared for). But they didn’t know this. That’s the thing: God doesn’t put Himself in the position where He has to explain everything to His children. He just expects them to trust and obey. Unfortunately, the Israelites had a hard time doing the latter, so they suffered unnecessarily. The route chosen by God meant an 11-day journey but they reached Kadesh-barnea on the edge of Canaan in about two years due to the fallout from their idolatry and sundry acts of rebellion. But God turned them back into the desert for another thirty-eight years after the fiasco following the unfavourable report by the men who were sent to spy out the land. * They ended up spending forty years in the desert and many of them died there. They missed the blessing of entering the Promised Land. Any child of God who insists on rashness, rebellion and generally acting like they know better than God never has it easy. That kind of attitude/behaviour leads to misery, frustration and when God completely loses His patience, death. That will not be our portion in Jesus’ name. May we receive the grace to truly allow God to be the Lord (Master, Commander, Controller, Director) of our lives and walk humbly with Him, obeying and patiently waiting for the fruit of His wisdom made available to us daily in Jesus’ name. Amen. The scriptures used in this article are from the New Living Translation of the Holy Bible. You can also like my Facebook page, Aunty Edith, follow me on Instagram, GooglePlus 1, Google Plus 2, Twitter 1, Twitter 2, Pinterest and StumbleUpon. Plus, you can connect with me on LinkedIn. Jesus is Lord! Almost everyone has had or will have such experience, but faith will direct such person to follow God if such person is a faithful person. No wonder the Bible says that our wisdom is like foolishness before Almighty God; he expects us to follow him and obey entirely. However, I am convinced that people who are being led by the Holy spirit, can and/or get revelations about God's plans and ways. John the Baptist found himself in such situation in Matthew 11 and indirectly questioned the messiahship of Jesus. The story of Job also teaches people to follow God no matter how bad your situation is. The word of God in the book of Jeremiah (7 :23) says......"obey my voice, and i will be your God, and ye shall be my people: and walk ye in all the ways that i have commanded you, that it may be well unto". That is to say that for one to be a child of God, he/she must obey him and follow all his ways (irrespective whether or not such ways or commands are beneficial to him/her). Nice work, Ma. God bless you for the message. Thank you, Chinagorom, for the kudos and the enlightening scriptures you brought in. You are blessed! Doing God's will imay be difficult in the interim, but it's always the best thing in the end. I appreciate, Lanna! You are blessed! Your poem is so beautiful. When I pray for my children or anyone to do the Lord Will for their life, I always pray for courage for them too. if they don't have the courage to step out and do it...then there's a problem. You're right, Marie! Good intentions are not enough except they are carried out and for that, we need courage. Bless you! Thanks a bunch, Debbie! God's favour and protection upon you and yours in Jesus' name. I'm always spirit-satisfied any time I read through some the numerous encouraging posts of yours. I have learnt to trust God even in the most ugly situations that I may find myself just like this (present) situation. Thanks! The walk of faith is not always easy but I find the alternatuve inconceivable. Bless you, Benjamin! Doing God's will requires great commitment and endurance. You cannot just wake up one day and say I will do his will. U will fail...All you need do is to look up to him for direction and guidance. Thank ma for this great piece. Nothing can be compared to doing God's will, as it gives satisfaction and a sense of fulfillment to your soul, even Jesus made the prayer "father let thy will be done". Surely, you can never be wrong or feel frustrated when you do God's will. SOMETIMES YOU MAY NOT LIKE THE PATH HE IS LEADING US BUT HE DOES NOT NEED TO EXPLAIN TO US, JUST OBEY HIM AND FOLLOW HIM. LORD I WANT TO DO YOUR WILL. Father please help me to love and accept your plans for me... Father i want to be fully yours, give me the grace to you..my master and my friend.. 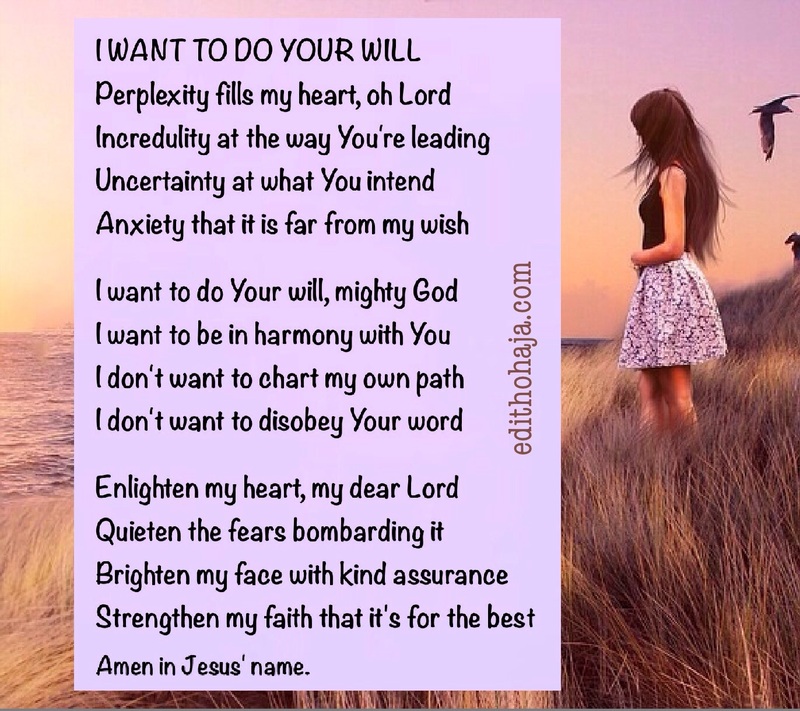 I want to do your will Lord and lets your will be done in my life. Lord almighty i am praying earnestly to do your will in all my endeavors in life.doing his will,will eventually guarantee us success in everything we do. God sure do know the best and always lead us there. There was a time i needed a job desperately then i found one which pay sounded great to me but he insisted i do not take it, i was mad at him 'cause he gave no reasons, later on God gave me a more comfortable job without stress and beyound my expectation.GLORY! Amen. I receive Grace to do your will Lord. God bless you ma.